George was an Attorney at Law. Resided at "Grooms" Nayland 1800/31. Miniature and silhouette in possession of E L Fenn Auckland NZ 1998. 1786 Nov 1 - George as Deputy Steward of the Manor of Nayland for the first time presided over the Court Baron. George also owned Hawks in Lt Horkesley. 1798 George was listed as an Out Sitter and paid 2/- Land Tax in Wissington by Nayland. 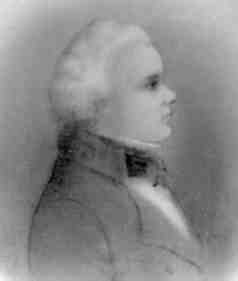 Edward Blair was also George Alston's friend, business associate and agent in London. George writes many invitations in warm terms to Blair to visit them at Nayland.
. . . . . The season is now come for felling timber, we expect the pleasure of seeing you here. . . . .
. . . . . Your wig is in hand, and is expected daily but as you propose to be in town so soon, perhaps you would like to see it before it is sent. The maker says that straight here is the present fashion, but I have ordered this to be like the former. Having observed your fondness for pork, I had thoughts of sending you a collar of brawn, but shall defer it till I see you, as the taste is peculiar. It is to me insipid food, though recommended by the name of fashion. Perhaps I may trouble you upon your return with some books for your neighbours. You are not yourself a bookish man, which is the reason I have not hitherto troubled you by sending any. I take the opportunity of Mr Whitmore's return to Neyland (sic) to send you for your sisters use, another number of Thompsons Scotch Songs. . . . . I send also a piece of Harpsichord wire (No.5) obtained from Broadwood's, which I hope will stand the necessary tension. No more sonatas are published than they have already, that is 6 by Pleyel and 6 by Kozeluck, having experienced that his chief profit arises from the songs. I have added also the frontispieces to the two first volumes, which were not published at the time with the music. Essex Record Office D/DOt E3 1 bdl. George also acted as Agent for Blair inspecting, and arranging repairs to be done on his properties, collecting rents and tythes, and negotiating with Blair's tenants. In reply to your letter of the 28th ult. I have no objection to the lath and plaster in the manner you mentioned . . . . . But whatever way is adopted must be undertaken immediately, or else deferred till the next spring lest the frost set in before it be dry, which will infallibly cause it to scale, and fall off. . . . . I learn from my brother, who has been lately down there, that W Sadler has spread a false report of me as having broken my word with him; for that I had promised neither to turn him out of his farm, nor raise his rent. I never dreamt of any such engagement; nor could he have any pretence to claim it. But had I even promised, I have kept my word; as he himself has refused to stay. He told me in person that I had used him generously, as well as my father and mother before me, in suffering him to continue upon the old terms for 40 years. Let him take care lest his short road to heaven, by the way of faith without works, should prove too long for him ever to reach it. All liars, we are told, are excluded. Had he been assured of my promise he would not have failed to have claimed it. . . . . I should have answered your letter sooner, but that I waited for the return of Mr Parish, by whom I sent you the last number of Scotch songs with a line of explanation. He told me yesterday that he delivered the parcel to Mr Harrold, who would hardly omit to forward your part of it, so that it appears a mere omission on your part to notice it in your letter. . . . . I thank you for your communication of yesterday, respecting the sale of Burrell's farm. But besides that I have not at present the command of so much money, the situation is not particularly eligible for me; and it is greatly encumbered with old wooden buildings, of which I have already a super abundance. Mr Gosling is welcome to some pollard's for fencing; only let him begin with the oldest and worst. Indeed his own interest should direct him to this, as his farm is crowded with a superfluity of them. I observed several which were cut down by his predecessor, and were left to rot in the neighbouring ditches. Mr Wiggins says that two loads of manure returned to the farm, is an equivalent for one of hay or straw carried off; but care should be taken that it is really returned.
. . . . . Mr John Barnard, executor to the late Dr Gibbons, called on me lately, to return me the copy of my sister's marriage contract. I see by it that her husband has no control over her fortune. She and her trustees have the absolute disposal of it, in all respects the same as if still unmarried; her discharge being good to all intents and purposes. A power is also reserved to apportion her children, according to her own and their discretion. . . . . The compliments of the season attend you all. What a horrible scene of slaughter is now carrying on in Germany. Surely the madness of Kings shall be richly rewarded! Record setGreater London Marriage Index. Blair writes somewhat cynically on George taking a second wife. I have been long ago instructed, that the marriage of a wife has sometimes hindered engagements of a much more serious nature, than that for which you apologise in your note of this morning: even the keeping of the marriage supper of the Prince of Peace. I do not however consign you to "outer darkness" for the deed but merely "inner darkness" of a private chamber; till you shall have fully expiated your offence, by incurring all the pains and penalties of matrimony. In a word, I wish you all the comforts the state is capable of, which however are in my estimation so small, that they are in no respect a balance for the certainty of their opposites. In truth though I had formed no conception of the party, I had an obscure expectation of some such new arrangement, from a certain derangement I observed at Horkesley; and it must be confessed that of two unavoidable wills, you have chosen the least. I presume from the name your lady is one of the two sisters I saw at Stoke last year. I wish her all prosperity. Let me know whether I shall send her a piece of plate, or other furniture, of the value of 20 guineas as a token of my sincerity. I take the liberty of referring it to her own choice, because I reckon that a thing of use is at all times preferable to a toy, and I should be sorry to blunder upon a useless complement.
. . . . . You will receive by the conveyance of the wagon, a couple of carpets for your two parlours, as new and as ugly as fashion can desire. I hunted in vain for a neat octagonal pattern for the front room, on account of the angular fireplace. But no such patterns have been manufactured for these last seven years; and though they offered to make one on purpose, they could not disgrace their name by keeping them on hand. But the single recommendation of fashion will, in the eyes of certain of your family at least, sufficiently overbalance other objections. The watch is repaired but not yet regulated. Certain parts which Georgehad been broken, will now be replaced by new ones, and it will be forwarded in a week or two. You have addressed your last letter to "No.45" which was the number of my former lodging. But my present is No.49 but I am strongly tempted to shift again, on account of the disgust of living among rogues. My drawers having been robbed the other day of a considerable quantity of linen viz: 3 shirts, 6 cravats, 7 handkerchiefs, 4 pair of cotton stockings, and 3 pair of white silk. My landlady's suspects a certain fat old woman whom she received for a few nights, and whose time of departure corresponded with the loss. Yet she refused to take any legal steps to identify the thief, lest she should bring a bad report upon her own house; choosing rather, woman like, to be herself suspected, than by proving it on the guilty, to clear her own character. Ann will say, what motive can induce her to such perverse conduct? The hope only of obtaining 3 1/2 guineas per week off a stranger. For though such an expectation never be realised, yet the conviction will operate as strongly as the truth. But even thus the contrivance is at best unnecessary, as she might at any time get quit of me, according to agreement. But you know women never go directly to their object; they love a little plot to bring about the end. When my tenant Creek came last to town to petition for the renewal of his lease, he told me your lady has a vessel on the stocks, but was unable to determine what time it would be launched. I was unwilling therefore to visit you at a venture, lest I should arrive at the unseasonable time of the groaning; which though you have not mentioned it, I presume must now be over . . . . . I propose however seeing you in the course of next week, when I hope to find you all in perfect health. And remain in the meantime, with my best respects to your lady etc etc. I have been this day informed by Mr Ball that he has yesterday dispatched the piano-forte to be delivered to you by one of the common stage wagons, on its way to Hadleigh. You will pleased to return the packing case by the same conveyance, and acquaint me with the day of its arrival in town, that Mr Ball may fetch it from the in in his own caravan, which will save him a few shillings for porterage. Address it to "Mr Ball, pianoforte maker, Duke Street, Grosvenor Square, London." You should have received it before but that I have waited till now, for the opportunity of replacing it by the sofa, which had been removed to the apartment of my fellow lodger; and who has but lately recovered from a tedious and severe sickness, notwithstanding the daily attendance of five medical gentleman. Having at length adjourned to his country house I regained the sofa just in the nick of time, for he relapsed and returned again within a week. A little further delay was occasioned by having the hammers new leathered, for the improvement of the tone; and replacing one of the pedals, which was broken off. After all, it will prove a useless piece of furniture to you both, who are not musical; but it was your ladies own choice: and utility is seldom consulted when the love of fashion predominates. . . . .
George reply's to Blair that he had received the piano consigned by him, arriving by wagon "to the great joy of my wife" Also mentions his wife is poorly and they are going to the sea at Aldeburgh. George writes to Blair that he, his wife and children "are much gratified with the change of the scene" at Aldeburgh. George writes to Blair 3 Feb 1818 "I have been confined to my bed five days, I am now only able to sit on a sofa in consequence of an operation for the removal of a tumour on my leg which as you may remember was the cause of my lameness. Without society and possessing but few books times passes very slowly with me. I therefore beg the favour any morning you can share time, that you would have the goodness to call"
George was writing from 2 Greville St, Hatton Garden London. George was the Steward for a number of Manors. Scope and Content Admission of William Henry Campbell, esq., eldest son and heir of Wm. Campbell, esq., decd. Piece of arable land etc etc . . . . . all copyhold of the manor of Foxearth Court of Sadler Whitmore, esq. Steward: George Alston gent., deputy for Samuel Alston gent. Scope and Content Admission of John Grimsey on surrender Robert Chaplin and Nathaniel Holmes, excecturors of Thomas Fenning [as in D/DU 381/33] Property as in D/DU 381/32 and a grovett part of Hulls with a way leading to Bromley Heath, all copyhold of manor of wix hall or Abbey Court of Rev.Erasmus Warren Deputy Steward: George Alston, gent. Scope and Content Admission of James Dear on d. of brother John Land (10 a.) in West Bergholt, copyhold of manor of Nether Hall alias Cooks Hall in west Bergholt Court of Thomas Brand, esq. Steward: George Alston, gent. Scope and Content . . . . . Court of John and Rich.Marriott, esqs. Steward: James Alston, gent. Scope and Content Letter of George Alston to unidentified correspondent, forwarding 'Mr Jay's Title completed by Mr. Harrington his atty.' and promising to send 'Mr Bullock's Title' when received from the latter's attorney, Mr. Frost. Scope and Content Admission of James Blyth, jun., on the surrender, as in 133/181 Property as in 133/181 Lord:Anne Hinde, widow Steward: George Alston,gent. Scope and Content Conveyance . . . . . (iii) John Ambrose of LondonManningtree, gentleman (trustee of a term of 1000 years assigned in this Conveyance); (iv) . . . . . (iv) John Mathew Greenwood of Lincolns Inn (co. Middx. ), esq., and George Alston of Nayland (co. Suff), gentleman (exors. of Samuel Alston, decd. ); (v) John Ambrose (trustee of George Bridges);. . . . .
Manor of Nayland with Downings - Rentals 1818. Mansion called the Groom 6d. For a piece of ground laid into the Wall Garden 4d. For the garden behind the mansion 1s 0d. For a piece of ground called Chamberlains Pt of mansion 4d. For a piece of ground also laid into Wall Garden 9d. For a piece of ground formd Doomsdales laid into Wall Garden 4d. For a piece of ground laid into yard opposite church 4d. For a piece of ground called Harlins Yard laid into Wall Garden 4d. Ref: Bury R.O. HA541/2/1/13 v 3s 11d. Manor of Wix & Mistley. Dates of Creation 29 April 1823. "Yesternight died at his residence at Nayland in the 68th year of his age , George Alston Esq". On Friday evening . . . . . Same day whilst sitting in his chair, George Alston of Nayland, solicitor. The Nayland Parish Register puts George's age at 69. I George Alston of Nayland in Suffolk hereby revoking all former Wills whatsoever by me at any time therefore made DO make this my last Will in manner following - And do appoint my loving wife Anne and my brother Samuel Alston executrix and executor thereof. I direct all my just debts to be duly paid. My desire is to be buried in the Church Yard of the Parish Church of Little Horksley in Essex. In witness whereof I the said GEORGE ALSTON the testat my hand and seal this seventh day of February in the year of our Lord one thousand eight hundred and eighteen. Signed sealed published and declared by the said testator as and for his Last Will and testament in the presence of us who in his presence at his request and in the presence of each other have hereto inscribed our names as witnesses - J.G. Sargeant, Jn Perry, Charles Edward Perry. I George Alston do hereby add this as a CODICIL to my Will hereunto annexed and desire that the same may be taken as part thereof. Whereas since the execution of any Will I have purchased a further part or share of a freehold estate at Lawford in Essex subject to a life interest therein Now I hereby give and devise all my fourth part of and in the said estate at Lawford an all other real estate which I have purchased since the execution of my Will unto my loving wife Anne her heirs and assigns for ever. AND whereas there is now . . . . . in my name in the three percent Consol Annuities L221.18.3 Stock transferred to one at the rate of 9% (sic) for L100 by the Rev. John Staples Hand for the amount of my son Samuels legacy of L100 and daughter Margaret's legacy of L100 left them by their Aunt Miss P Vanderzee Also the fourth part of the residue of her effects given by her to my daughter Maria of whose Will the said John Staples Hand is sole exectuor. Now my Will and devise is that on my son Samuel's attainment of the age of twentyone years there be paid or transferred to him one half part of the said sum of L221.18.3. stock also and accumilated interest whereon and likewise on the interest thereof after the sale of three pounds per centum per annum. And that on my daughter Margaret's attainment of the age of twentyone years or be married which shall first happen the remaining half part of the said L221.18.3. stock be paid or transferred to her together with the like accumulated interest thereon And that on my daughter Maria's attainments of the age of twentyone years or be married which shall first happen there be paid or transferred to her the said L714.7.7. stock tegether with the like accumulated interest thereon the said sum of L221.18.3. and L714.7.7. stock to be paid at the price the three percent consol (sic) shall be at the expectations mentioned for payment thereof. In witness whereof I have hereunto set my hand and seal this twenty ninth day of October in the year of our Lord one thousand eight hundred and twenty five. Signed sealed published and declared by the said George Alston as and of a Codicil to his Will in the presence of us who in his presence at his request and in the presence of each other have hereto subscribed our names as witnesses. I George Alston of Nayland in Suffolk do hereby add this as a CODICIL to my Will and desire that the same may be taken as part thereof Namely I give to my two nephews Charles Alston and Henry Alston two hundred pounds apiece of lawful money of Great Britian to be paid to them or their executors or administrators at the end of six months next after my death. Written with my own hand and seal this seventeenth day of July in the year of our Lord one thousand eight hundred and thirty. Proved under L35,000 in London with two codicils the 8th March 1831 before the Court by the oath of Ann Alston widow the relict one of the executors to whom admin was granted being first . . . . . by . . . . . duly to administer . . . . . . . . . . to Samuel Alston the brother the other executor . . . . . . . . . . The following are references to some of the legal work done by Samuel Alston and his sons James and George at their Nayland practice. I have been this day informed by Mr Ball that he has yesterday dispatched the pianoforte to be delivered to you by one of the common stage wagons, in its way to Hadley. You will pleased to return the packing case by the same conveyance, and acquaint me with the day of its arrival in town, that Mr Ball may fetch it from the in in his own caravan, which will serve him a few shillings for porterage. Address it to Mr Ball, pianoforte maker, Duke Street, Grosvenor Square, London. George next married Anne Margaret VANDERZEE  [MRIN: 57], daughter of James VANDERZEE  and Philadelphia MEAD , on 24 May 1806 in Holborn St Andrew LND. (Anne Margaret VANDERZEE  was christened on 29 Mar 1776 in Gt Burstead ESS, died in Feb 1856 in Nayland SFK and was buried on 22 Feb 1856 in Nayland SFK.). The cause of her death was an aneurysm of the aorta.